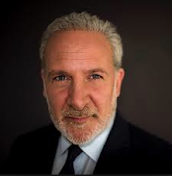 Peter Schiff On The Markets: Nasdaq 5,000. This time around its not really a tech bubble, its just the entire U.S. Economy is one gigantic bubble and that is what makes it so much more frightening for the economy and for investors. Remember, within a year of the Nasdaq first getting above 5,000 points, it dropped 4,000 points. We had a eighty percent decline. And so, people need to be cognizance of the risks when you get into the market at these levels.